It seems appropriate to write about this particular comic book today, the 6th anniversary of the passing of comic book titan Joe Kubert. This is another book that was purchased by my younger brother Ken, and eventually found its way to me. He went through a period where he had a passing interest in World War II stuff, whereas I was never really all that interested in war comics. 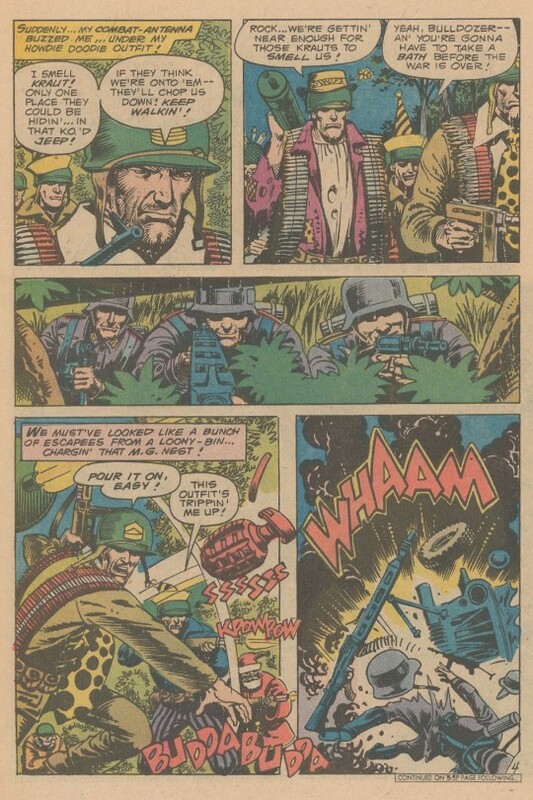 Kubert edited this issue, as he did for several years worth of SGT ROCK, and he executed the cover, his lush, untempered brush strokes unmistakable. The Rock story in this issue was written by the character’s creator, Bob Kanigher. To be honest, I was never much of a fan of Kanigher’s work. 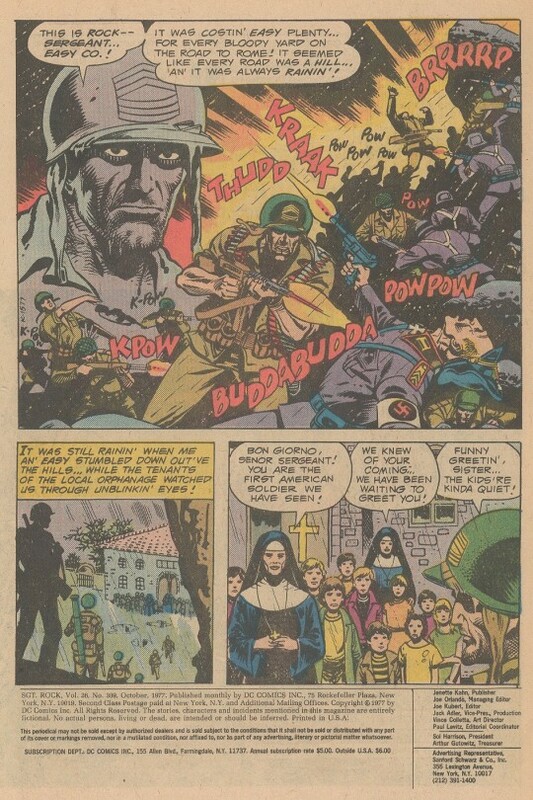 It seemed formulaic to me, even then, and there was also often a discordant feeling to it–as though Kanigher held the material in contempt. But that could just be me projecting. And he certainly wrote enough comics and worked on enough key features of comics history to be considered one of the greats of the field. The artwork in Kubert’s titles was almost always a cut above, both due to Joe’s great eye for talent and the fact that every artist working for him had to know that he could draw anything a given story might ask for, and often better than they could. You had to be on your game to bring in pages to Joe Kubert, I think. In this instance, the artwork was done by Lee Elias with inks by Romeo Tanghal. Elias had a long career in the industry and at DC, but because he never had a long stint on any of the super hero series, he’s largely overlooked today. As far as the story goes, Easy Company comes upon an orphanage at which the children have been struck dumb by the horrors they have experienced. 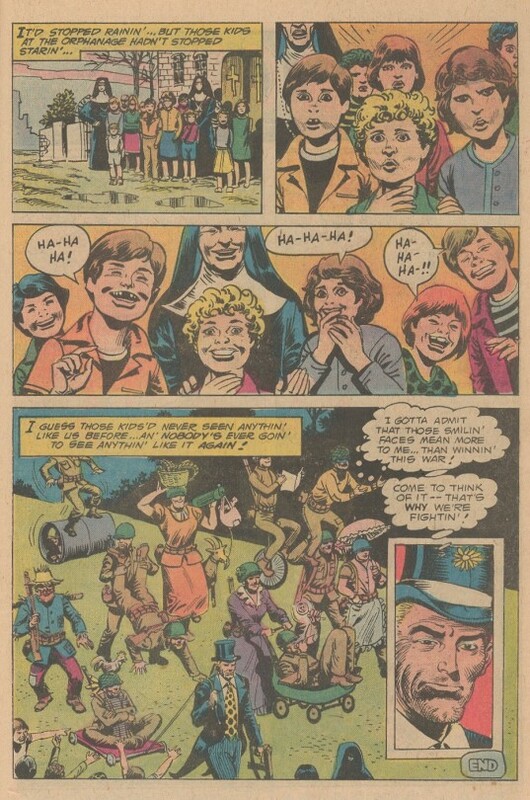 The head Nun suggests that some laughter might bring the kids out of their shells, and so Easy intends to return the next day, all dressed up in outlandish costumes, and throw a Christmas party in July for the kids. But as they make their way back to the orphanage, they are attacked repeatedly by enemy forces and have to defend themselves while kitted up like clowns. And, honestly, that’s the whole of it. Even by Kanigher’s standards, the story is slight. There’s incident, of course, but no particular conflict or theme beyond the surface of the piece. It’s just a series of engagements, with the soldiers of Easy Company having to replace the tattered remains of their clown costumes after each one, scrounging the items to do so. But hey, the kids are happy by the end, so everything turns out all right. 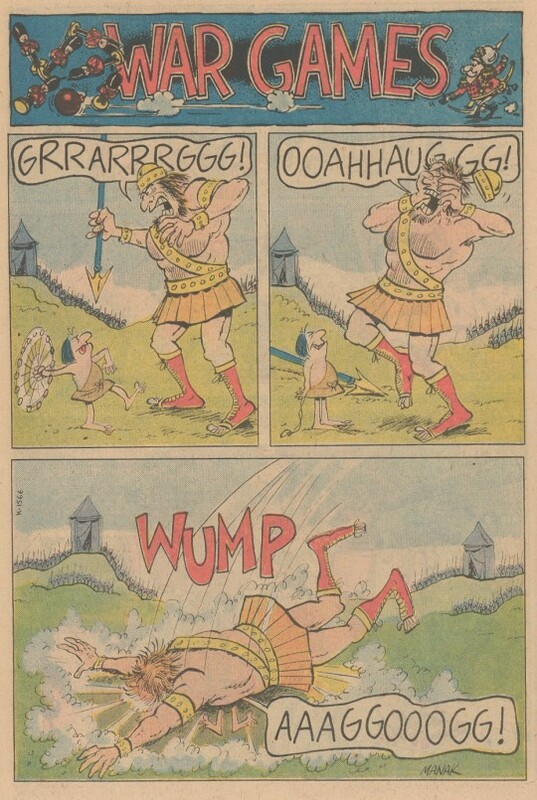 Next up is a very simple single page gag strip by Dave Manak. It’s set in medieval times, so I wonder if it wasn’t a hold-over from PLOP. 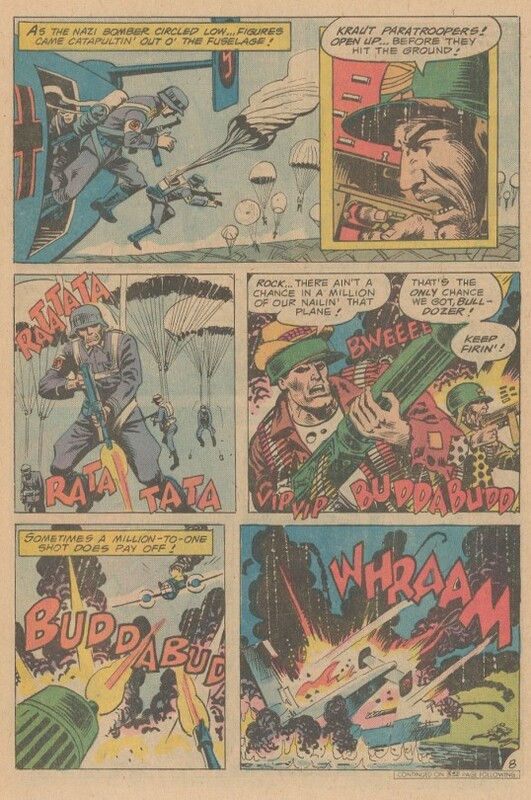 Kubert used these sorts of single page strips in his titles longer than just about anybody else, a throwback to the days of the Golden Age of Comics where every issue would include multiple features. 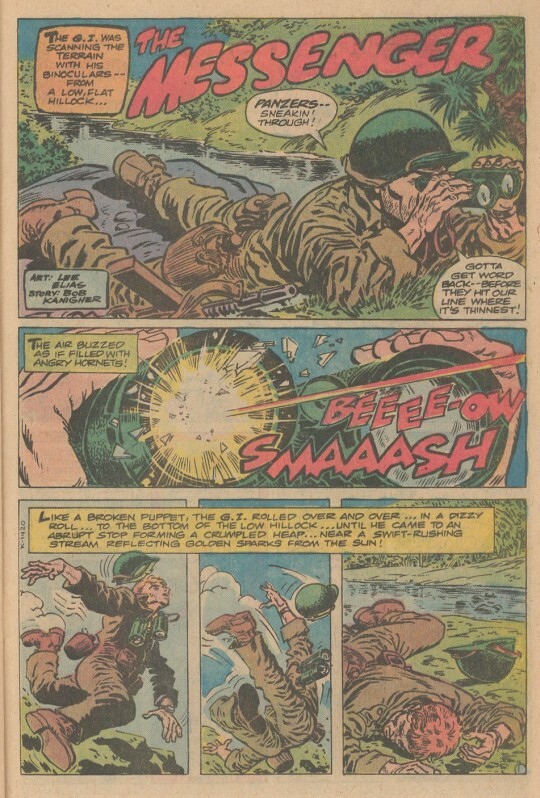 The back-up is also by Kanigher and Elias, It’s a simple but effective tail of a fatally wounded scout needing to get a message back to his unit about an impending Panzer attack. So he scrawls a note and sends it down the nearby river in his canteen. The canteen is found by a local boy who, discovering the note within, posts it to the rectory bulletin board. There, it is spied by his unit commander, who is able to call in an air strike upon the approaching Panzers. And the kid is happy–he gets a new canteen out of the deal.